Developmental Loci Harbor Clusters of Accelerated Regions That Evolved Independently in Ape Lineages. Some of the fastest evolving regions of the human genome are conserved noncoding elements with many human-specific DNA substitutions. These human accelerated regions (HARs) are enriched nearby regulatory genes, and several HARs function as developmental enhancers. To investigate if this evolutionary signature is unique to humans, we quantified evidence of accelerated substitutions in conserved genomic elements across multiple lineages and applied this approach simultaneously to the genomes of five apes: human, chimpanzee, gorilla, orangutan, and gibbon. We find roughly similar numbers and genomic distributions of lineage-specific accelerated regions (linARs) in all five apes. In particular, apes share an enrichment of linARs in regulatory DNA nearby genes involved in development, especially transcription factors and other regulators. Many developmental loci harbor clusters of nonoverlapping linARs from multiple apes, suggesting that accelerated evolution in each species affected distinct regulatory elements that control a shared set of developmental pathways. Our statistical tests distinguish between GC-biased and unbiased accelerated substitution rates, allowing us to quantify the roles of different evolutionary forces in creating linARs. We find evidence of GC-biased gene conversion in each ape, but unbiased acceleration consistent with positive selection or loss of constraint is more common in all five lineages. 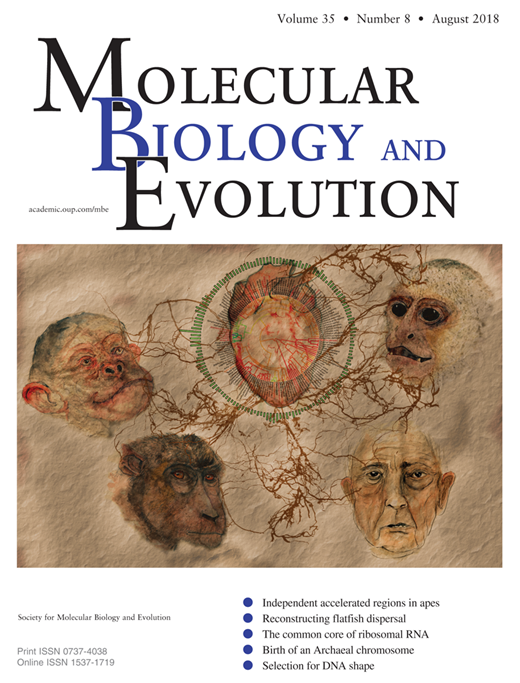 It therefore appears that similar evolutionary processes created independent accelerated regions in the genomes of different apes, and that these lineage-specific changes to conserved noncoding sequences may have differentially altered expression of a core set of developmental genes across ape evolution. Departments of Developmental Biology and Computational & Systems Biology, Pittsburgh Center for Evolutionary Biology and Medicine, University of Pittsburgh School of Medicine, Pittsburgh, PA. Gladstone Institutes, San Francisco, CA. Phylos Bioscience, Portland, OR. Department of Epidemiology & Biostatistics, Institute for Human Genetics, Quantitative Biology Institutes, and Institute for Computational Health Sciences, University of California, San Francisco, CA. Gladstone Institutes, San Francisco, CA. Department of Epidemiology & Biostatistics, Institute for Human Genetics, Quantitative Biology Institutes, and Institute for Computational Health Sciences, University of California, San Francisco, CA. Chan-Zuckerberg Biohub, San Francisco, CA.